Milan 2010: a self-assembly chair designed in 1974 by Italian designer Enzo Mari has been put into production by Finnish furniture brand Artek. Customers purchase pre-cut pine boards, nails and instructions and construct the chair themselves using just a hammer. The chair is part of Mari's 1974 project called Autoprogettazione, a collection of furniture to be made from the most basic and affordable materials. Sedia 1 - Chair can be seen on the Artek stand at Spazio Rosana Orlandi in Milan this week. Artek have also produced a short documentary called Enzo Mari for Artek: Homage to Autoprogettazione, premiered yesterday at La Triennale di Milano design museum. Sedia 1 – Chair is the first object from the famous and thought-provoking project “Autoprogettazione” (1974) to go into production with Artek. 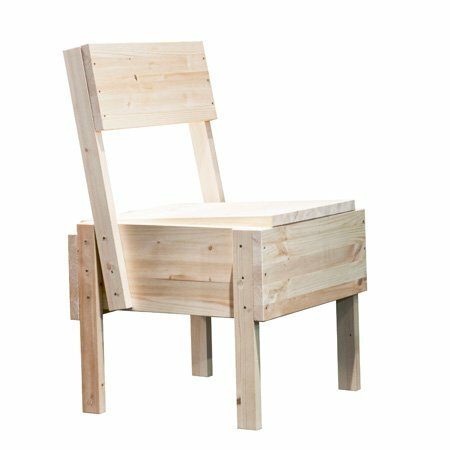 In line with the original idea of the project, customers will purchase a set of pre cut pinewood boards, nails and instructions for the chair. ”Design is always education,” sums up Mari. Artek has also produced a 20-minute documentary “Enzo Mari for Artek: Homage to Autoprogettazione” in which Mari explains the idea behind the concept. The film will receive its world premiere at the Triennale Museum during Abitare Talks on Wednesday, April 14, at 6 pm, in the presence of Enzo Mari. Enzo Mari is a designer, thinker and provocateur. Determined to develop mass-produced objects without compromising his belief that the outcome should always be beautiful to look at and feel while being functional. Mari developed “16 Animali” (Danese, 1957), “3087 Vase” (Danese, 1969), the chairs “Sof Sof” and “Box” (Driade, 1971 and Castelli, 1975) and “Smith & Smith” kitchen tools (Zani & Zani, 1987). These are just some of his more than 2000 projects that have marked design history.